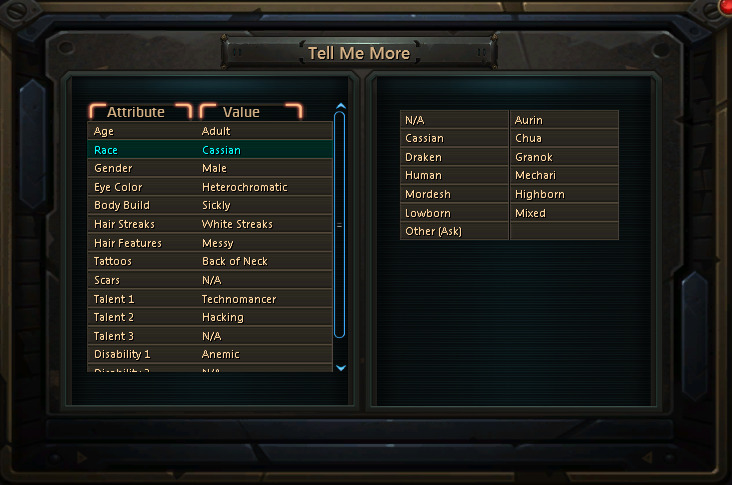 I have made a mockup of an idea that I had for profiling addon. Since we are limited by tranmission space so tightly, I was trying to figure out how to get the most data conveyed in the smallest amount of text sent. The way I found around this were to use predefined values that you can select from a list for each characteristic, below are some mockups. 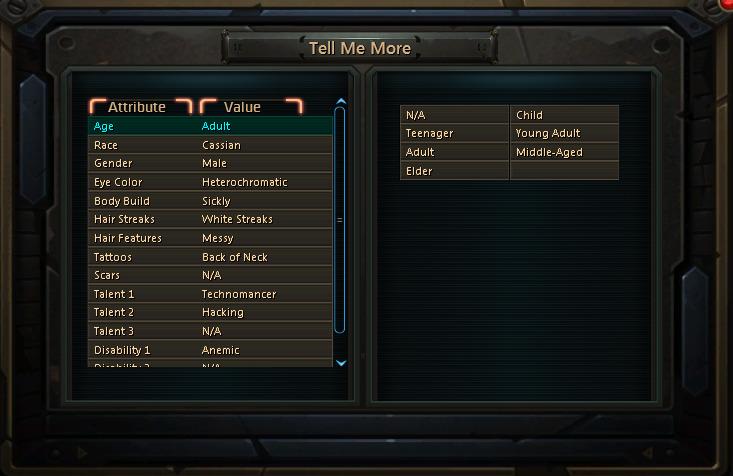 This is just the personal selection screen to show how the options/layout would be. Inspecting others has not been implemented yet (but is planned if this goes over well). Please provide feedback on if you think this will be adequate, and what other categories you would like to see if so, and what selections you would want in the categories. I am writing it so that it is quite easy to add new selections for a category, so it can be updated over time if someone requests something specific (For example, if someone wanted cross-eyed or something), but overall should be able to generate something that would help others get a better idea of your character. I know some of the categories are sorted weird for profiles (Like having height at the bottom instead of with age/build/etc). I have an idea in mind that will let me set the render orderings of these descriptions but it is not ready yet. So far, looking pretty cool. I like how specific you've managed to make single word descriptions. It's compact! I can't wait to see more. Updated screenshots, changed the UI a ton and added a non-networked demo version for others to see if they like it! Please let me know if you encounter any errors! I will get the networking up soon. Probably a few things you could remove if you were cramped for space, but a great start! Maybe a jewelry feature category? Or special props? CRB's done us wrong on the new inter-client comms API. It's not "impossible" to work with but if you're not intimately familiar with the techniques used to deal with limited shared bandwidth it's pretty much close to that. Start reading up on things like AX.25 and CSMA-MD. Might want to read a few research papers on optimal timeslot scheduling for TDM. This is what's frustrated and burned out 2-3 prior efforts. You need to know how much data you can push within a reasonable amount of time before you start designing your attribute list. Any property that takes up more than 20 bytes is probably going to be a non-starter. The way this is designed is that every attribute will be transmitted as one character. We can send 100 characters (not bytes) per minute, so allowing send-throttling and some global caching when someone requests a profile will get this down to a pretty low transmission rate. In the current example, each attribute can have an attribute list of 64 elements (Can probably be increased if needed to a maximum of the total number of characters available). The data is transmitted as a pseudo b64 string, where each character is the value of the element that is selected. So if there are 15 elements, only 15 characters will be sent per request, which is well under the 100 character limit. I was going to cap attributes to around 25 different ones for 25 characters transmitted. I am also going to figure in 1 char transmissions for a heartbeat/keepalive so that you can see who has the addon installed that is online and whatnot, and 1 char transmissions for a profile request from someone. To render the requested player data, it will decode the pseudo-b64 strings into the attributes and values. If you look at the code, the variable self.DataStructure keeps track of the order of what each index of the received encoded string will be. My predicted estimate would be under 50 chars per minute under really heavy usage. This will allow 50 characters per minute for other addons to use as well, since it is shared. *nods* Ayep, this is about what I expected. A good test location will be a busy RP event with a good number of folks using. Then you'll now if your estimates are good or if you're going to start throttling all over the place. Good start, Titor. Sounds workable. The CRB post that outlined the data rates listed those values in characters per second. Has testing show that to not be the case? Another worry of mine is the messages per second stat. The qualifier was "per channel type" and not "per channel". Hopefully that was a mistake otherwise if you have multiple apps sending global messages (public or private) they could starve each other if they get too chatty and there's no way to tell who did what. Ah, hm. I just checked the developer post and it says in characters per second, however Togglebutton's comment in the "What do you want to see in a profile addon" thread said it was in character per minute. I am not sure if they have more information/a correction that is not reflected on the forums, but if it is in character per second, the library becomes much, much easier to use and much more data than anticipated can be easily transferred. This would be good if it is in seconds, because then I can add 'pages' and stuff, perhaps, for future iterations of the addon. This looks like a really awesome approach given the current limitations. Thanks for putting time into this, I look forward to seeing how it turns out.